The OOSS Board of Directors adopted a number of planning initiatives in 2016, including one that focused on partnership strategies to improve the accreditation process for ophthalmic-driven outpatient surgery centers. Open to the formation of partnerships with new and established accrediting organizations, OOSS executed a pilot partnership agreement in March of 2017 with the Institute for Medical Quality (IMQ), a physician-centric not-for-profit accrediting entity new to the CMS (Medicare) deemed status market. 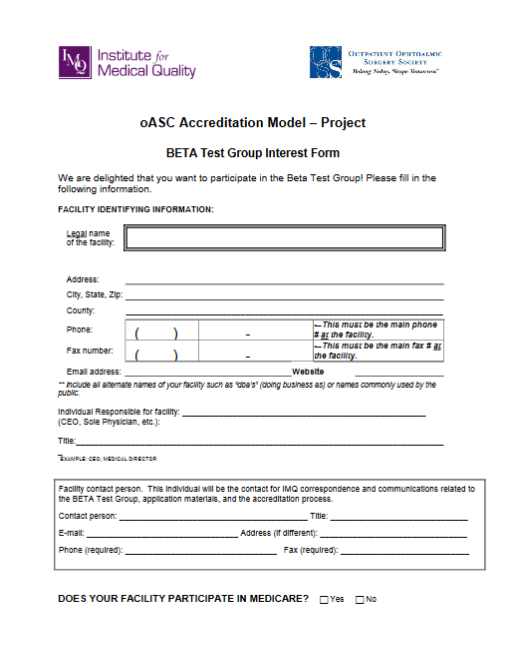 At this stage in the IMQ/OOSS “oASC Accreditation Model Project,” we are now accepting a limited number of participants for our BETA test. Read below for details. The IMQ/OOSS “oASC Accreditation Model Project” was designed to allow IMQ to engage the voice of the ophthalmic ASC customer directly. IMQ is using that voice to redesign a complete deemed status survey process that effectively and efficiently addresses the unique characteristics and purposes of ophthalmic-driven ASC. This project also will allow OOSS to identify subject areas for the development of online educational programs and other online and live program and resources. The first stage of the IMQ/OOSS “oASC Accreditation Model Project” was the ALPHA Test Group. Seven facilities were recruited from the Executive Committee of OOSS, of which four completed the process including those represented by Drs. Jeff Whitman, Frank Cotter, David George, and Jon-Marc Weston. Feedback from the ALPHA Test Group was very positive. IMQ requires many documents … surveyors arrive knowing the ASC’s policies, so the survey is more efficient … no scrambling on the day of survey to find documents for the surveyors. IMQ informed us that the application was complete … it was nice to know that all was in order. Surveyors are friendly and knowledgeable of the ASC P&P and the standards … easy to work with … the staff felt very comfortable. The surveyors were very thorough, watched all the processes all the way through. Had fun during the survey – that never happened before! The surgeons like that the surveyors were physicians – they were able to have relevant conversations. They understood the MD side of the ASC. The process was amazing and I really enjoyed it. There were two surveyors at the same time. This is much better because I was back to work after one day. The survey felt less intrusive. The surveyors are ahead of the game when they arrive. They know the ASC P&Ps. Suggest IMQ explain in the application why they request the documents. The BETA Test is open to OOSS member facilities only. If you are interested in participating, please submit the INTEREST FORM to Victoria Samper, VP of Ambulatory Accreditation, by January 31, 2019 (see contact info at bottom of page). The survey is for Accreditation with Medicare deemed status. The BETA Test Group runs through the end of 2019. If you are interested and have an expiration date in 2019, please submit the interest form. Victoria will reserve your spot. Application fee ($975) is waived for BETA Test participating facilities. Survey fee $6530 (discounted from $9495, in exchange for honest, meaningful feedback in the form of a quick telephone survey with Victoria). Life Safety Code Survey $2750. IMQ does not have membership fees or annual fees beyond those referenced above. If you have questions about the BETA Test Group or the survey process, please reach out to Victoria Samper, VP Ambulatory Accreditation at vsamper@imq.org or 415-882-5173.